AVA’s commitment to supporting emerging artists remains a touchstone of the organization. Every year, AVA hosts a group exhibition of emerging visual artists from the region. This competitive exhibit is designed to support artists at critical points or crossroads in their growth and development. This opportunity is only open to artists with a well-developed, recent body of work who have not had a solo show and are not represented by a commercial gallery. The exhibit is juried by AVA’s Selection Panel. Entry is free for AVA members. There is an entry fee of $25 for non-members. You may pay by either credit card, check or money order. 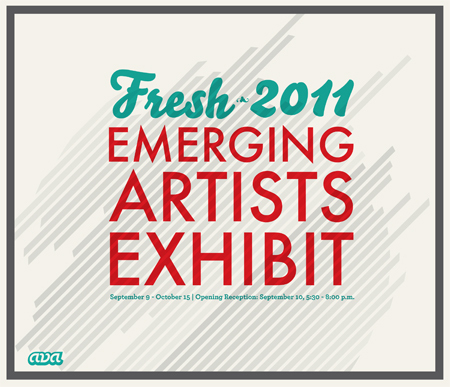 For more information about Fresh 2011, or other AVA programs, please visit avarts.org or call Lauren Goforth, Programs Assistant, at 423-265-4282 ext. 105. For more information about Fresh 2011, or other AVA programs, please visit avarts.org or call Lauren Goforth, Programs Assistant, at 423-265-4282 ext. 105.